This article describes, with photographs, two rock shelter sites with possibly prehistoric paintings located in Sirumalai (Little-Hills), Dindigul District, Tamilnadu, S. India. The first site was reported in the Indian Express newspaper in 1984. The second site has not to my knowledge been publicly reported. A collection of photos of the paintings can be found on Dropbox via the link given below. Sirumalai is an isolated group of hills lying to the North of Madurai and to the South-east of Dindigul. It is partly forested and partly cultivated. Some slopes, particularly on the western edges, are not easily accessible. The hills are occupied mostly by Hindu Tamils originally from the surrounding plains. However, they are also home to Paliyar adivasis (tribals), many of whom continue to lead a traditional semi-nomadic way of life. The first rock shelter is at Aruvimalai on the south-western corner of the hills, very close to the Maavuttu dam. I believe this dam can be reached by road or track from the highway below. The rock shelter was visited by Dr G Vijayvenugopal, Reader in Tamil, Madurai Kamaraj University, sometime in 1983/4. He was brought to the site by Sirumalai locals, including a Paliyan. I met Dr Vijayvenugopal in June/July 1984. He suggested the paintings might date from about 500 BC. I then visited Aruvimalai with the help of some locals and took photos of all the paintings. 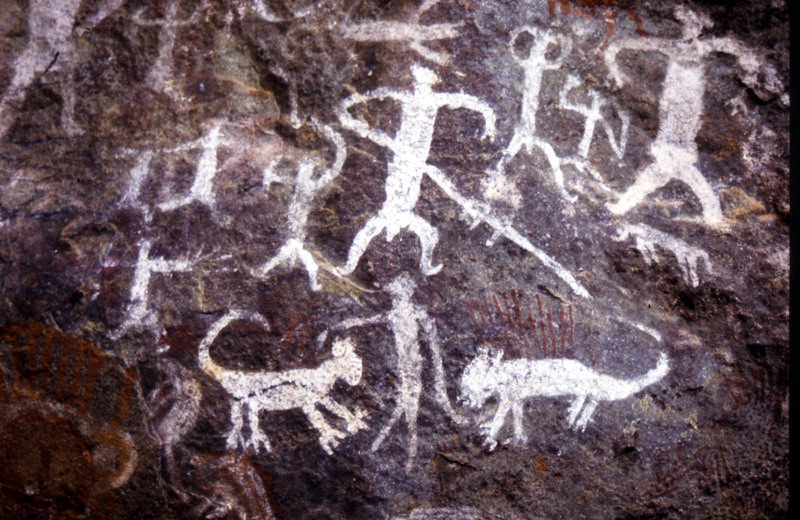 As can be seen, they are painted in red ochre and white and consist of human, animal and other figures. The site is clearly a rock shelter, not a cave, with the cliff overhanging the level area beneath. The second rock shelter is, I believe, at Alangaltheri, in a cliff face at the head of a forested valley above the settlement of Thalikidangu. I visited the site in July 1984. Again, it is in the south-western part of the hills, although I am otherwise not sure of its precise location. I was taken there, by a Paliyan, after a walk through the forest above the cliff on no visible pathways. We then had to climb down a short way to reach the site. The shelter was some 30 feet long, varied between 16 and 6 feet in height and 20 to 4 feet in depth. It sloped some 30 to 40 degrees above the level ground. The remains of a fire suggested that the shelter had been recently used. 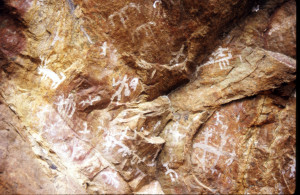 The presence of modern Tamil letters among the apparently prehistoric paintings also suggested that this shelter had been in more contemporary use. Again, I photographed all the paintings. I also asked the locals who had accompanied me – Hindu Tamils and the Paliyan guide- to interpret some paintings whose ‘meaning’ was not clear to me. I have added notes to the photographs accordingly. 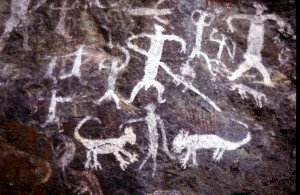 The photos are can be found on Dropbox via this link : Sirumalai Rock Paintings. The photos are free for academic and non-commercial use. If you want to use them commercially, please send me an e-mail first. I would welcome informed feedback on this post. Cave paintings in Sirumalai, Indian Express, 05 February 1984. Paliyar – plural; Paliyan – singular.